In May 1976 I had to make a very difficult choice. Was I going to take my end-of-year Economics exam, or play on a recording session in Manchester with the Ivy Benson Big Band, my first professional studio session? Both on the same day, what a clash! I remember closing the enormous Economics book and saying to my Mum I have to play on that session. End of my degree course at the Polytechnic of Central London after just one year. At Strawberry Studios I met most of the band for the first time. I was nearly sick with fright. Kathy Stobart was there on baritone, my sister Bernice was Ivy’s bass player. However, the person that created a buzz in the studio was Carol MacBean. No longer with the band, she had been Ivy’s tenor player for several years. As some of the horn section steadily got through several carrier bags of beers, they warmed up and despite no prior rehearsal with this particular line up, there was some great playing. I can still recall what a great sound Carol had and she could really improvise. We needed one more number to complete the album at the end of a marathon day. Ivy called ‘The Pink Panther’. Carol, despite being a bit worse for wear by this point stood up and played the theme beautifully with a couple of great bluesy breaks. I often wondered what happened to Carol McBean? Never heard of her again. Then last year there was a big Ivy Benson Band reunion in Bristol. One of the old band mentioned that Carol McBean had played in the Reunion Quartet set. Her married name is Carol Gasser and she still plays regularly in Cornwall. Not only that but gigs regularly with Claudia Colmer-Lang – this was Ivy’s legendary double bass player from the 1960s, who also lives in Cornwall. I happened to be playing with ARQ in St Austell in November and managed to hook up with both of them. It was great meeting them and I managed to persuade them to come up to London, the first time in over 35 years for Claudia, to play at the Vortex as part of the Tomorrow the Moon season. 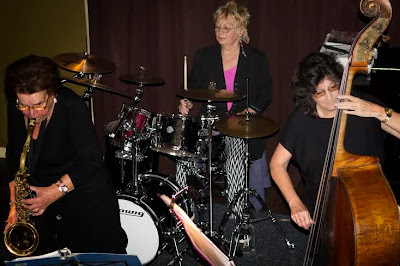 A recent BBC Radio 2 programme Sax Appeal: Ivy Benson's All Girl Band about the legacy of Ivy Benson features Carol, Claudia and Crissy talking and playing.